Maylasia and Indonesia’s forests are being destroyed at an alarming rate. Indonesian Borneo according to The World Bank will be logged out by 2010! Up to half of the Orang-utan population has been killed already. Could this truly wonderful creature be extinct before the London Olympics? Illegal logging seems to be beyond the control of govenment, or is it that they just don’t don’t care? Illegal logging was on the agenda for the G8 Summit in Scotland but in the end deemed not worthy of a mention. 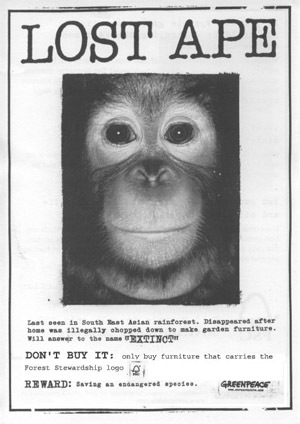 Don’t buy rainforest destruction in the form of garden furniture.